Last night after work, I finished my little September quilt for SQT. I used perled cotton and a big stitch in the border. This is a pretty shameless copy of Marian’s little quilt. See hers here. I used a scrap of fabric from IKEA on the back. Though large in scale, it seemed appropriate. Now it hangs in the sewing room. I can see that I rushed a bit on the tiny binding and it shows. Not my best work. I also received a lovely squishy package in the mail yesterday. 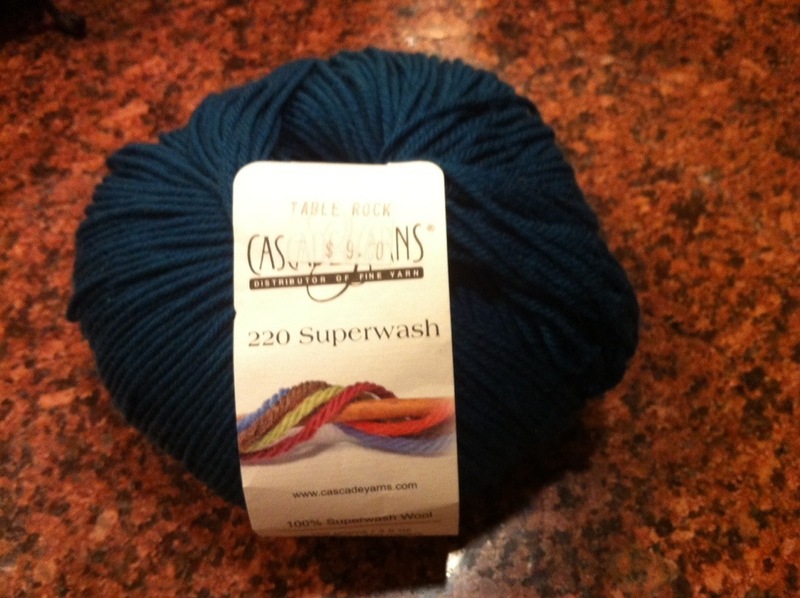 It was this beautiful wool yarn from Aunt Marti of 52 Quilts fame. It is to be used to make a hat for a sailor. You can read more about Hats for Sailors here. Isn’t it lovely? She is so generous! She has made over 20 hats for sailors just this year! I cast on and got two rounds of my hat done last night. Feels good to finally have something on my needles! And for the first time in a long time, I am linking up with Judy at Patchwork Times for “What’s on my needles?”. 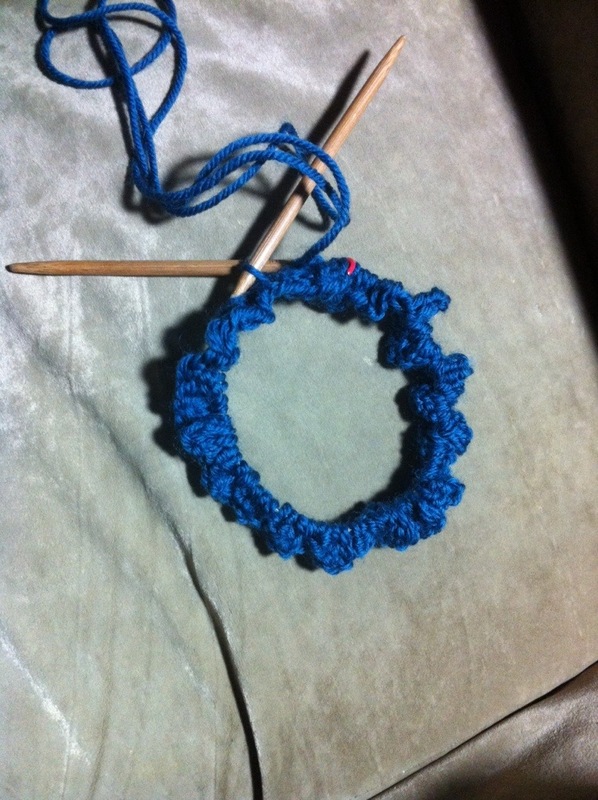 Click here to see what others are knitting. This afternoon my little friend is coming over to sew again. We are going to start her tote bag. We shall see how far she gets. I am linking up with Kelley for Needle and Thread Thursday. 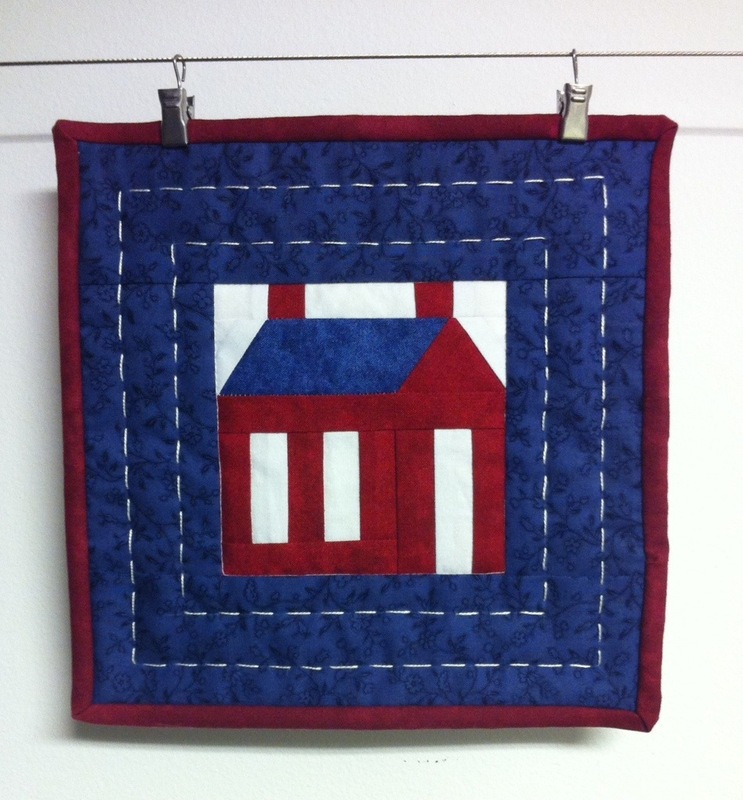 This entry was posted in Doll Quilts, Knitting, Small Quilt Talk Group. Bookmark the permalink. That little mini is super cute! what a cute wall hanging, and I love the large scale print on the back. It looks really neat! Tell me about your hanging line please. I think I need something like that. It was so nice to meet you yesterday. Thanks for the lovely comment on my blog. You made my day. 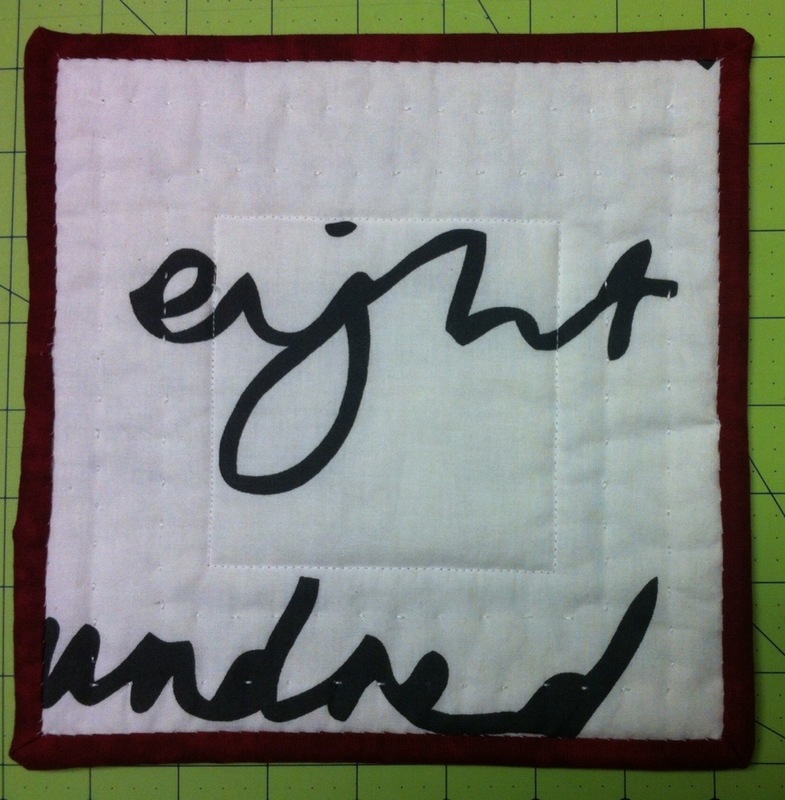 I love this little quilt and I see it came from a book, which I guess I’m going to have to purchase now. 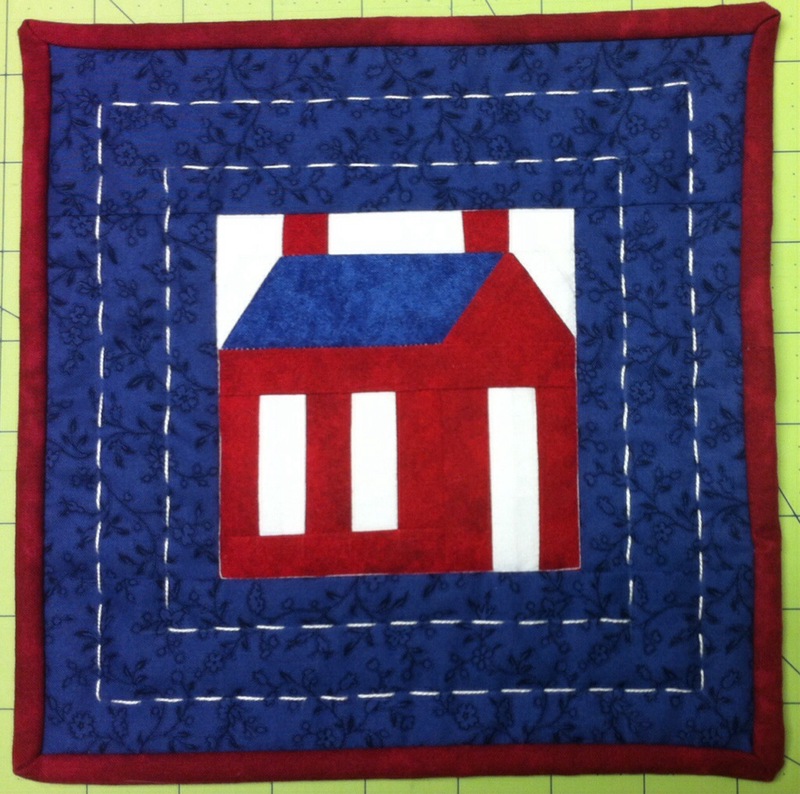 LOL I love paper piecing and house blocks. I also have been enjoying mini quilts lately. I like the stitches around it. And your binding looks fine. Thanks for joining my giveaway. 🙂 Have a good day. (I wish I could knit. Hats for sailors sounds so cool). Your block is adorable. I’ve just recently found your blog and will be following. What an eye candy! Beautiful quilt stitches!